Markets have been marching ahead last week, ES leaving the 875 level behind. It seems like this bull run finds no major resistance, but are we really going straight to 1000 now ? 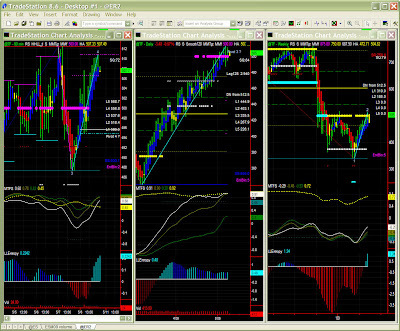 On the 60 mins chart, we'll watch 930 (stall level) and 937 (new resistance level). 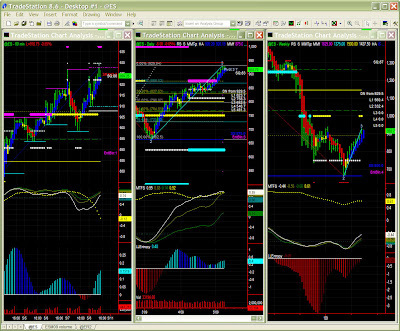 ES actually hit 927.75 and a provisional pivot is already showing. It is recommended to trade those waves on a slightly lower time frame. The daily chart is staying strong, minimizing the impact of volatility on the 60mins chart, hence while we do see energy exhaustion at this level, the MTFS pattern points higher. We have to acknowledge however that the MM levels haven't budged yet, i.e. strong resistance level has not moved to 1000. If we add that a pivot is also showing on last high, shall we see the expected retracement at last. As always, we'll wait for a red bar, and since MTFS is so bullish, profit taking isn't likely to bring prices lower than the 16 or 31% Fib levels. The weekly chart is also showing a provisional pivot. Again, we do not anticipate a change in the dominant trend. The situation is exactly the same on ER (TF), with however significantly more hesitation on current levels, and here again some profit taking would provide some order in this chaotic environment.